Early in just about every year, I buy a bunch of stuff at Sephora and other places. LOL, it's just true! I try to write dates on products when I open them, then toss them out when they're expired. I snapped some photos of the latest products that I've added to my vanity, with shoutouts to the ones I'll use until empty and buy again. First off, I bought Maybelline's The Blushed Nudes palette, because I needed new eyeshadow but wasn't sure about investing in one of the NAKED palettes yet. Honestly? While I wish the pigmentation was stronger, I feel like for a drugstore brand, this is a solidly good neutrals palette. I can do day and night looks. 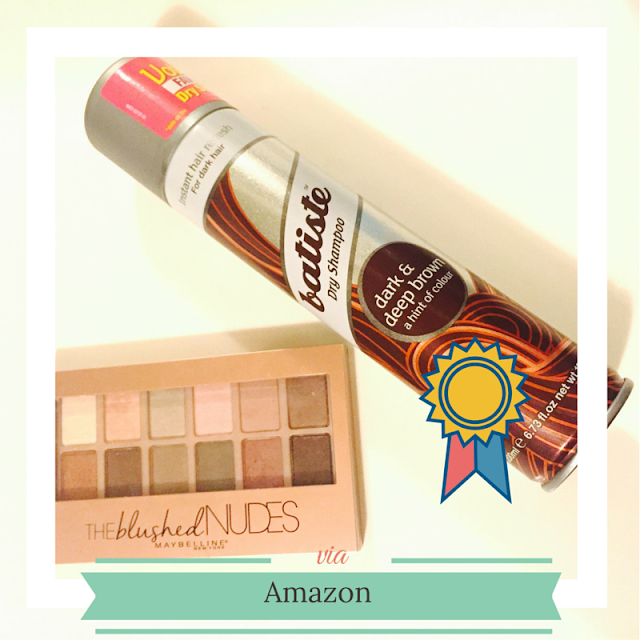 But the real winner from my Amazon shopping spree was a new dry shampoo, by Batiste. I got the one best for my hair color, Dark & Deep Brown. For the price (under $10), I think this is a fantastic dry shampoo! It smells good, and it has color to it, so you cut grease/oil but without white powdery residue. There's definitely color to it (spray it on your hand to see) but I think that helps the effect. My first Sephora haul in the beginning of the year yielded a mixed bag. First off, NARS Lip Pencils are the bomb, and this one replaced one I'd almost completely finished! Dolce Vita is the matte color I wear most; to me it looks only slightly different from my natural lip, enough for impact. I love the chubby pencil, it's a winner! It's my daily lip. I also got Benefit's Watt's Up. It's a great shiny highlighter, but I wasn't blown away because it was shiny enough to feel a little young for me... being a thirty-something and all. I also got a Foreo Luna Mini to replace a dead Clarisonic. While it does a good job exfoliating, and it stays cleaner and travels better than my Clarisonic, it doesn't give that luxurious brushed feeling that Clarisonic does. It gets the job done. The two new rock stars from this batch were Living Proof Prime Style Extender and Urban Decay's Chill Makeup Setting Spray. I got the idea for the Style Extender from a mention by Fran. I don't blow out my hair often, but I've found that when I use this product then style my hair, IT STAYS. Next day hair, hello! I got the smaller size to try it out, and also in case I wanted it for travel. As for the Makeup Setting Spray, if you touch your face (I know, bad) like me, or you aren't great at getting your makeup to stay, USE THIS. I spritz it on my face daily, and now when I get home it doesn't look like I skipped makeup that day. It stays! So Round 2 goes like this... I needed some face wash for travel that would remove makeup, and I was having a bad day. 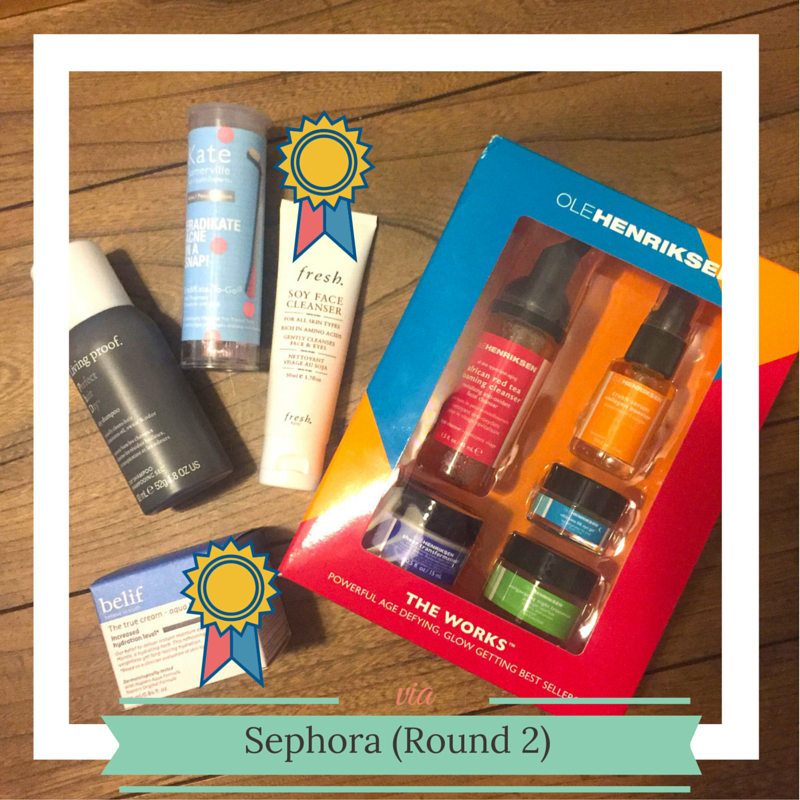 Then I stumbled into Sephora and went for a bunch of items in trial/travel sizes to test! The Living Proof Perfect Hair Day is a great travel-size dry shampoo, which was my aim. I'm not sold yet on these Kate Somerville Eradikate acne swabs, so far they haven't helped me much with spots. And I'm enjoying the tingling sensations of the Ole Henriksen collection as a way to work day/night anti-aging into my routine, but the jury's still out on long-term improvements. The winners in this group are awesome! First off, Fresh Soy Face Cleanser is my new best friend. I was so impressed by how a little bit of this stuff takes off the whole days' makeup, even after setting spray! While I don't like the smell of cucumber, this stuff is so gentle and silky that I don't even mind it. I will buy the bigger bottle to keep at home soon, and take this on trips. I was also very impressed with Belif's Aqua Bomb moisturizer, a product out of Korea. Put this on at night, and you still feel moisturized by morning. I love it! It's part of my routine, and it lives on my nightstand now. 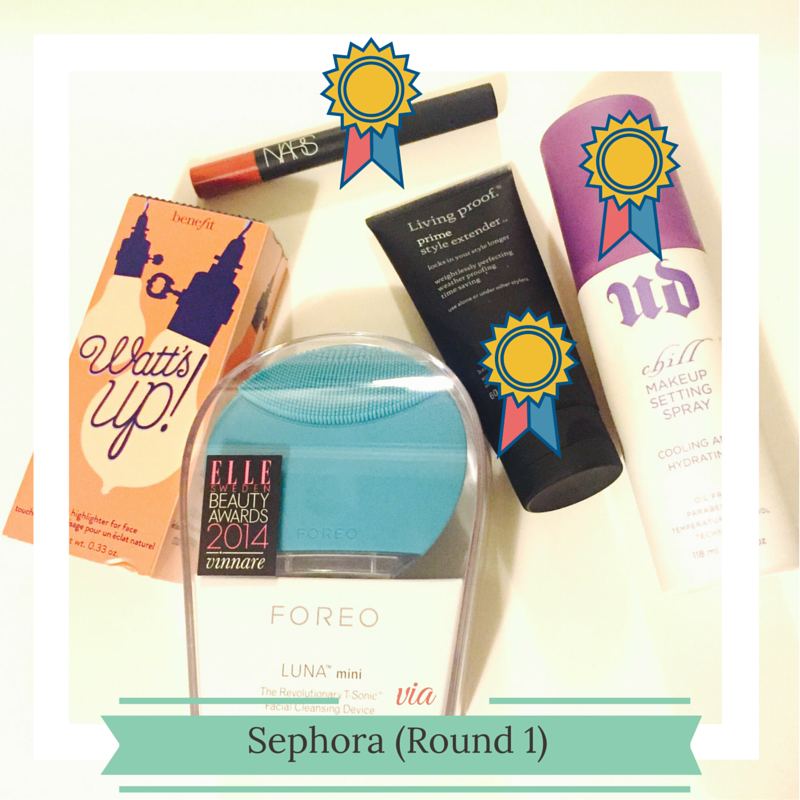 Overall, there were winners in each "batch" of purchases. While it's kind of extravagant to purchase so many products at the beginning of each year, to me it's healthy to toss out expired product (look for the little symbol that says 6M, 12M, etc. on your products!) and start fresh. Many of these items will last me all year! :) And I feel pampered and renewed, which is the aim. 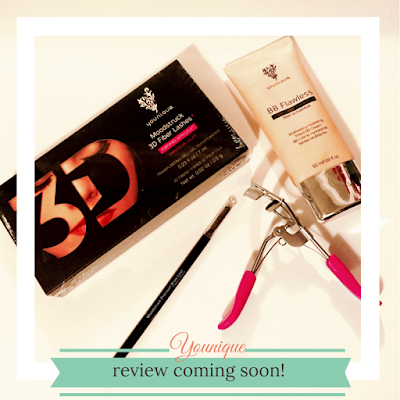 Coming soon... review from some new Younique stuff I bought via a friend!